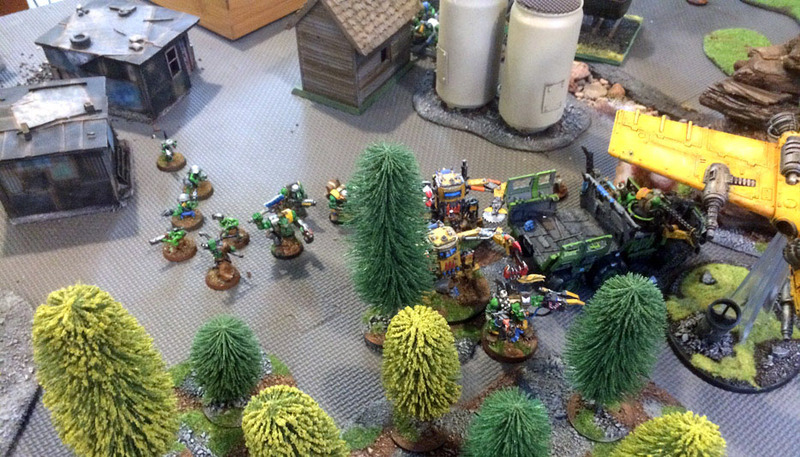 Orks advance through a tangle of dense terrain as they advance toward the Imperial firing line. “Imperial troops today launched an assault on the xeno-occupied Z’yra Mines, the first attempt by Imperial forces to wrest territory back from the xeno menace to our world.”—News Report, Imperial Voxcast, 3 837 735.M41. “Today, the Imperial High Command announced that the Imperial attack on the Z’yra Mines was repulsed with heavy losses.”–News Report, Imperial Voxcast, 3 845 735.M41. 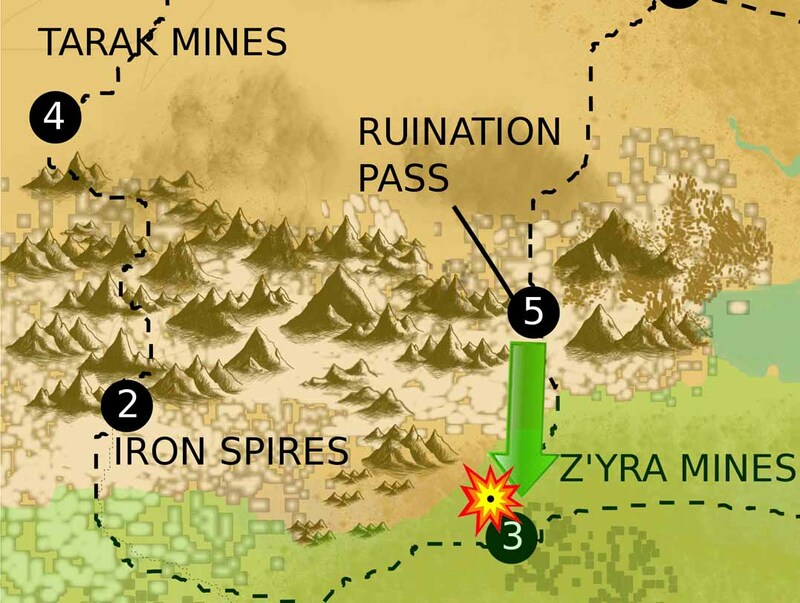 The Battle for the Z’yra Mines was launched on 3 837 735.M41 on the world of Hegira in the Sculptor System. 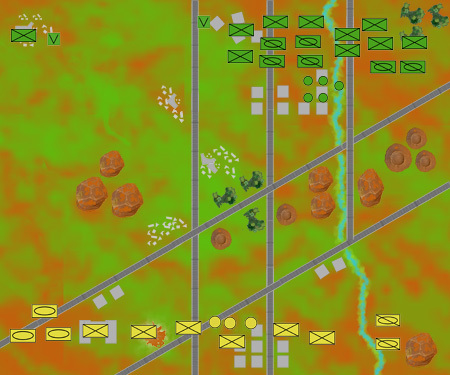 The battle was spearheaded by the 728th Cadian Regiment, under the command of Col. August Klein. This was the first serious attempt by Imperial forces to retake territory lost to the ork invasion that began two years earlier. It was hoped that success would place the Imperium in a position to split the xeno forces and finally end the war. After departing their starting point in the Iron Spires, the 728th Cadian Regiment took six days to cross the barren desert that surrounds the Z’yra Mines. During that time, armored vanguards, screened by Chimera-transported support troops, met light resistance from sniping Gretchin. Resistance stiffened, however, when troops reached the edge of the mining complex and entered the maze of mine entrances, refineries, and hectares of residential slums that once housed loyal Imperial workers. Despite heavy casualties, Imperial forces managed to reach the inner circle of suburbs to the mine complex by 3 842.735.M41. The next morning, hours before dawn, Col. Klein had his command awake and deployed—with his armor on the left flank and a wide firing line of infantry in the center, with a company of armored stormtroopers (3rd Veteran Mechanized Co.) stationed on the right flank. Initial deployment of forces (04:00). While deploying, however, Imperial forces were startled by a clever ork ploy: giant searchlights illuminated the Imperial line for a brief moment and then went dark. In the tense minutes that followed, Imperial troops waited fearfully for the bellow of a xeno charge—but the only sound to be heard was the rumbling engines of Imperial armor idling in the darkness. There were no signs of xeno movement, which raised question about what powerful force could hold back thousands of normally battle-eager orks. Imperial intelligence officers quickly warned Col. Klein that it was likely the ork warlord had used the searchlights to observe the Imperial deployment and reposition his forces. While orks typically are not astute tacticians, analysts noted, some warlords do possess a rudimentary cunning. In the moments before the sun rose, this analysis proved correct. The roar of ork vehicles pierced the pre-dawn darkness, and from the growing concentration of noise, it was clear the xenos had put the weight of their forces against the Imperial right flank—and had put some critical distance between themselves and the Imperial armor on the opposing flank. 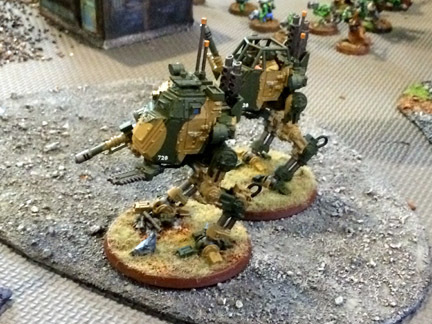 Imperial Sentinels advance to confront the ork horde. Actual fighting began just before the sun rose. 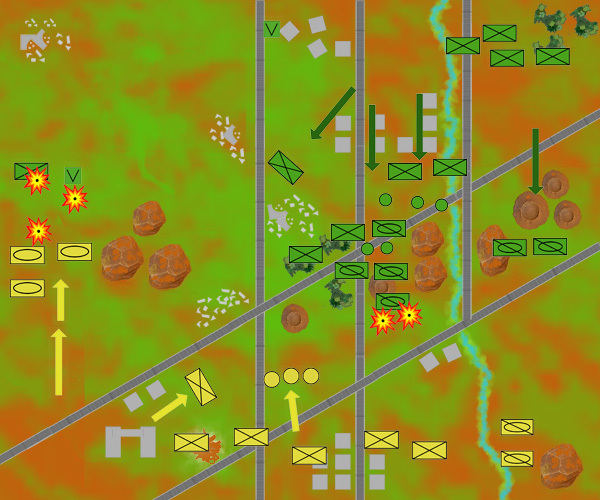 Col. Klein ordered his armor to advance on the left flank and attempt to move behind the ork line. Meanwhile, on the Imperial right, Imperial pickets began to trade fire with an immense force of ork battlewagons, Killa Kans, and thousands of ork infantry that was weaving its way through the dense urban terrain, using cover to avoid fire from the main Imperial line. It was the intent of Col. Klein to turn the ork flank with his armor, but when the lead tanks began to take heavy fire from rokkit launchas hiding in the ruins to their front, the armor commander ordered a halt to the advance and engaged the orks with long-range fire. In the darkness, however, the results of this firefight proved underwhelming, and the Imperial attack started to fall schedule. While ork forces advance on the Imperial center and right flank, the 2nd Armored Co. attempts to break through the left flank. It is met by a small but ferocious counterattack. The orks were not as hesitant. Although vastly outnumbered and outgunned, several hundred orks charged out of the ruins, letting loose ill-aimed rokkit fire as they ran forward. More alarming to the tank vanguard, the orks released a small herd of squigs—primitive but ferocious xenos—with armor-piercing bombs strapped to their backs. While this attack was beaten off (further delaying the Imperial armor’s advance), the orks on the far flank were quickly navigating the tangled ruins of the mine complex, confident that the urban terrain protected them from Imperial fire. As they began to clear the ruins into open ground in front of the Imperial lines, the most serious fight of the battle began. Click here to read how the battle ended.